How Keisha Whaley built Brass Tacks Collective to challenge a creative industry standard. Keisha Whaley has known that she has a propensity for teaching others since she was young. And after a few jobs at advertising and marketing agencies, she saw that the antiquated creative industry internship model she’d seen firsthand desperately needed to change. Whaley founded Brass Tacks Collective to challenge status quos—namely the concept of months-long internships that demand 40-hour workweeks from unpaid, inexperienced postgrads. Brass Tacks is the first teaching agency of its kind, and each year seven paid apprentices gain real-world experience working for local clients, from startups to nonprofits and other small businesses. Brass Tacks functions as a branding and marketing agency and apprentices work under creative leads, sitting in on client meetings and making pitch decks while handling real-world scenarios from budgeting to deadline shifts. 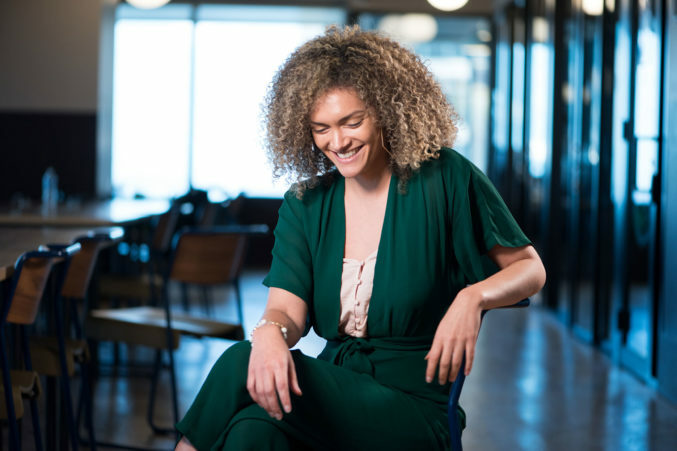 Whaley says that her experiences with WeWork have been serendipitous, and the company has stepped in to help her business afford space through flexible leasing options from the get-go. She was among WeWork Thanksgiving Tower’s first tenants and has come to appreciate the on-site perks, like a classroom where she holds open workshops on topics from editing and proofreading to videography for apprentices, the public, and other WeWork members. Out of a pool of 2,000 applicants in 2017, Brass Tacks was among 34 finalists selected. For its gusto and unconventional way of business, Brass Tacks was a perfect candidate for WeWork’s inaugural Creator Awards program in 2017. Through these awards, WeWork seeks to reward entrepreneurs, startup businesses, nonprofits, and artists at any stage of their growth by putting $20 million in grants on the table and opening up a competition for businesses of all shapes and sizes. Out of a pool of 2,000 applicants in 2017, Brass Tacks was among 34 finalists selected to pitch its business plan at the South Regional Finals in Austin in late June. They did it by illustrating the Brass Tacks apprenticeship model in action and shooting an 90-second, apprentice-produced video. “It was incredible, and we were able to buy the computers and the software that we needed,” Whaley says, adding that she used another portion of the money to hire another staff member. And as Brass Tacks continues to take on clients and expand, Whaley’s optimistic that WeWork will continue supporting her teaching mission along the way. So if you’re looking to develop or expand your brand identity and breathe some innovative new life into your marketing strategy, call Brass Tacks Collective. And if you think your small or budding business has the potential to shine with WeWork’s help, apply for the 2018 Creator Awards.